This is a guest post written by W. Jason Gilmore (http://www.wjgilmore.com) the CTO of DreamFactory, Inc., an open source API automation and management platform. Prior to joining DreamFactory he spent much of his career as a consultant and developer, helping teams around the globe build amazing software solutions. Jason is a prolific writer on the subject of web technologies with almost a dozen books and more than 300 articles to his credit. He serves as a special technical advisor for several startups based in Ohio and New York. Modern organizations are under tremendous pressure to efficiently process and incorporate data into every initiative. In fact, the emphasis placed upon extracting, compiling, analyzing, and disseminating information is such that an entirely new field of study known as data science has emerged to make sense of it all (for those of you thinking this sounds suspiciously academic, take note that Harvard Business Review called data science The Sexiest Job of the 21st Century. In addition to formalizing the data management process, IT teams have increasingly embraced heterogeneous database environments and API-driven development in an effort to ensure data can be ingested, processed, and distributed with minimal friction. Gone are the days when an entire organization standardizes upon a particular database vendor; instead, it’s now commonplace for enterprises to embrace a mixture of both commercial and open source SQL and NoSQL solutions. Of course, there must be some sane way to manage data as it flows through these databases, and that’s where APIs come in. Because databases must often be queried from a variety of applications (iOS, web, etc. ), developers have in recent years eschewed application-specific libraries in preference for APIs. By creating and plugging into a uniform API, developers can focus on the application itself rather than database-related plumbing. Or at least that’s the idea. The reality is, building and maintaining a database API is an extraordinarily time-consuming and costly endeavor. While an experienced team can build a CRUD API interface in perhaps a few weeks, they often don’t take into consideration the many additional requisite features necessary for API management. Capabilities such as authentication and authorization, request volume limiting, caching, and logging are often not considered when planning an API, and figuring out how to implement these capabilities in a piecemeal fashion can be extraordinarily difficult and costly. Many organizations avoid these headaches by adopting an API management platform. One particularly popular such solution is DreamFactory. Not only is it open source (commercial versions offering advanced capabilities are also available), but it also includes native support for Couchbase! 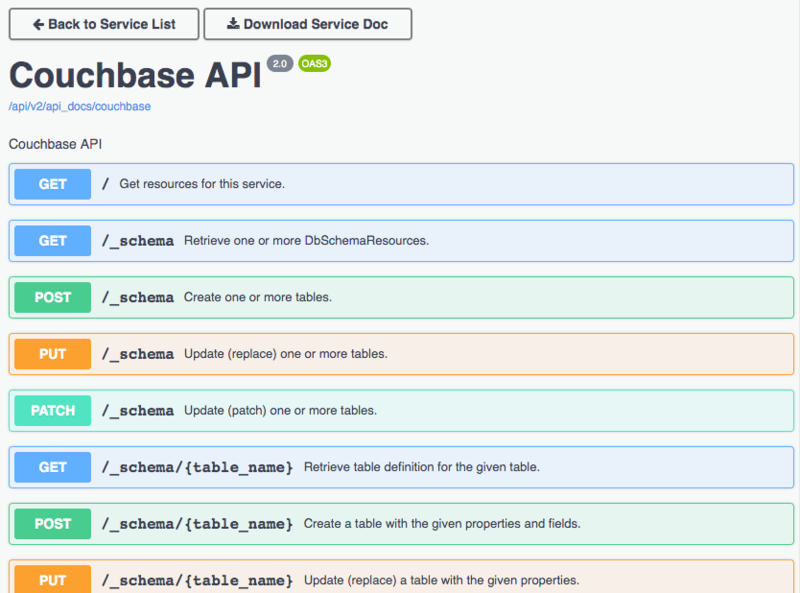 In this post you’ll learn how to generate a Couchbase REST API using DreamFactory in just minutes, and then lock down API access using DreamFactory’s role management feature. DreamFactory is an API automation and management framework used by tens of thousands of organizations around the globe. 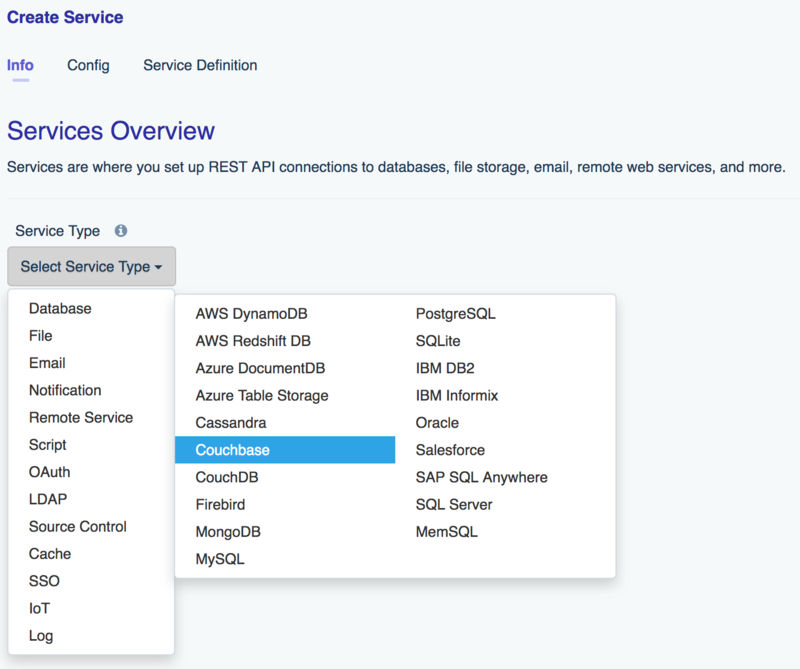 Although its popularity largely stems from the ability to generate full featured, documented, and secure APIs for a variety of SQL and NoSQL databases with no coding required, DreamFactory actually supports thousands of data sources and third-party services, including e-mail delivery providers, mobile notification services including AWS SNS, Apple and GCM Push, and for converting SOAP services to REST. In addition to the Host, Port, Username and Password fields, you can optionally cap the number of records returned by a GET request, and enable data caching for a set period of time. For the purposes of this tutorial I’ll leave those options untouched and just generate the API by pressing the Save button. NOTE: Because of the breadth of supported databases, and the importance placed on providing a uniform database API interface regardless of the underlying database type, DreamFactory uses generic terms for referring to database-related structures. Logically, these terms don’t always map exactly to database-specific terminology. For instance Couchbase uses the term bucket to represent a database, whereas DreamFactory uses the generic term schema for this representation. The API Docs interface is great for learning more about how an API works, however you’ll inevitably want to begin querying the API from a web or mobile application. To do so, you’ll want to first generate an API key. This is because DreamFactory doesn’t support the concept of a public API; all APIs are protected by at minimum an API key. Further, each API key is mapped to a role. DreamFactory roles determine what it is a client in possession of an API key can do in conjunction with the API. For instance, you might create a role that is read-only, or which might only allow access to a specific database table, or which might only be able to insert records into one table but read records from another table. There are a few other interesting features here, however for the sake of brevity I suggest just pressing Save to generate the role. Congratulations, you’ve just created a restricted read-only API key! Now let’s use that key to talk to the Couchbase bucket. Of particular importance here is the X-DreamFactory-Api-Key header! It’s here where the API key is supplied. Neglecting to supply the key will result in a 400 status code with an error message pertaining to a missing key. Additionally, if this key attempts to access a restricted table or perform an action (insert, update, etc) that hasn’t been expressly allowed within the role definition, a 401 unauthorized status code will be returned. The DreamFactory website: The official DreamFactory website includes all kinds of information about the platform. Getting Started with DreamFactory: This recently published guide to DreamFactory fundamentals walks you through key platform capabilities. In particular I suggest reading chapter 3. DreamFactory Academy: DreamFactory Academy includes several introductory videos. You might additionally want to check out the much more expansive Youtube channel. DreamFactory downloads: DreamFactory is available in a wide variety of versions, and is supported on all major platforms. Head to this link to choose your desired version! DreamFactory blog: You’ll find a stream of regularly published posts about DreamFactory features here, including this recent post about creating a geofence API using the Haversine formula, PHP, and DreamFactory’s scripted API services.